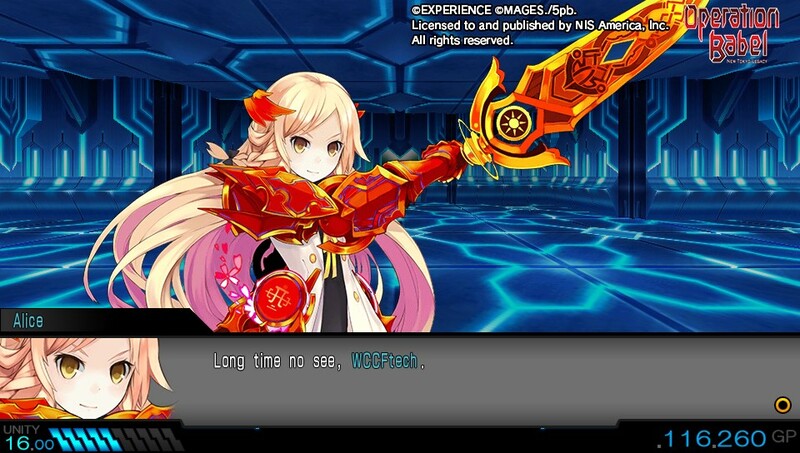 Experience Inc. has slowly been introduced to the Western audience as developers of a very signature style of dungeon-crawling RPG. 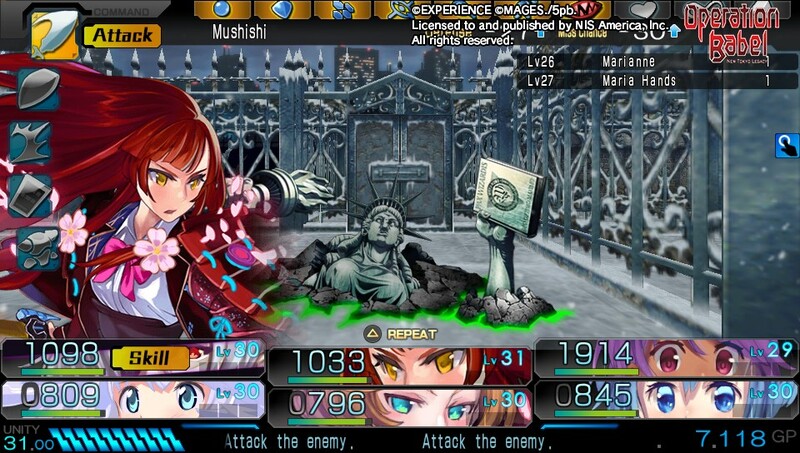 Similar in essence to the more famous Etrian Odyssey series on Nintendo handhelds, Operation Babel: New Tokyo Legacy acts as a follow-up to a previously Vita-exclusive Operation Abyss. 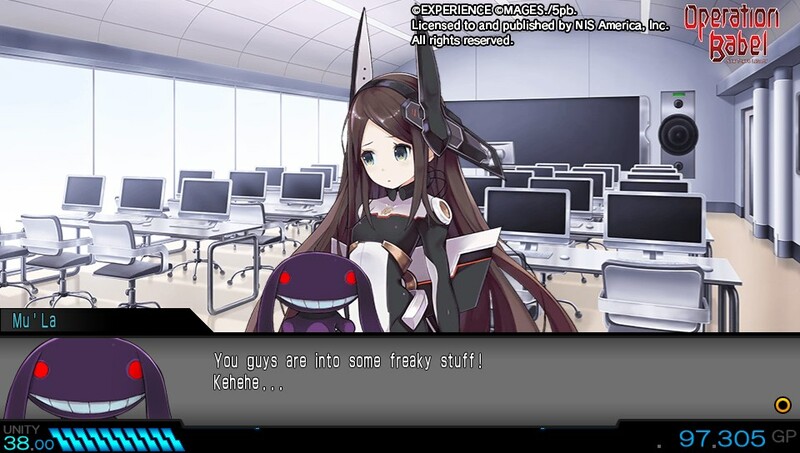 While it’s non-essential to play Abyss, the previous story and tactics provide a strong framework for new members of the Xth Squad to prepare for the extraterrestrial menaces to come. 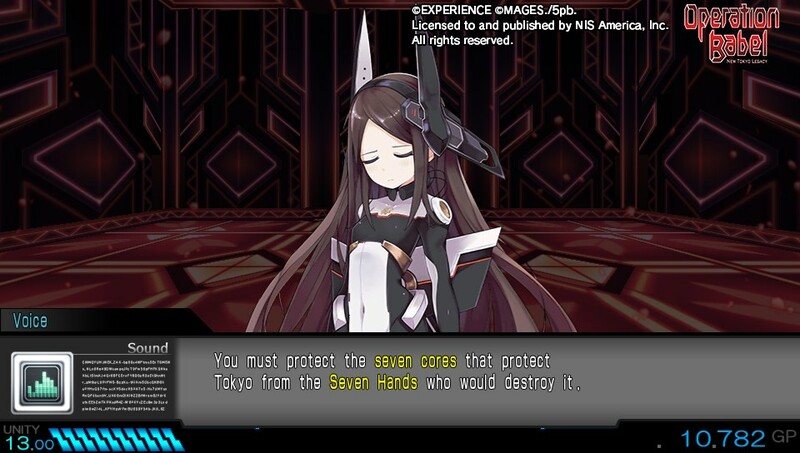 Operation Babel’s story picks up right where its prequel, Operation Abyss, passed the story baton. Just as the world feels saved from the Variant menace and the Xth Squad gets the chance to relax, a new world threat emerges to promise destruction. In a world where both Code-based magics and technology rule, it’s the threat of ‘The Embryo’ that threatens Tokyo with imminent devastation. As a follow-up to Operation Abyss, expect to see a number of familiar faces that exist as little more than cameo appearances that don’t do much to drive the narrative. Instead, The Xth Squad is introduced to a new face of evil named Kieru and his group of Seven Hands (which, you guessed it, are seven major bosses to defeat). Taking a note from the yet-to-be-localized Labyrinth Cross Blood, party members are able to be given an additional layer of depth with the inclusion of sub-classing. By taking on a second class, players gain all of the perks of added skills and an increased HP with the only detraction of slower leveling (experience gained is divided between the two classes). Much more than a minor gain in strategic importance, this allows spellcasters to pull from two schools of magic, or grant the Knight class a boost in evasion by subclassing into Assassin. The Experience-developed line of dungeon crawlers all have a very distinct feel to their gameplay loop, and Operation Babel is no exception. No matter how defensive you build your party, there’s always a matter of luck that can be all that stands between a party member withstanding a brutal attack or getting their head lobbed clean off by a random critical hit. That sense of danger never truly goes away, until the player vastly out-levels the enemy variants and grows into the proper builds. The last thing any player wants is to have one of their back-row spellcasters get targeted and eliminated in a single strike; to improve their odds of survival, raising their PHY stat to 15 is the first thing players should focus on. A high luck stat helps all the same and should be a secondary focus alongside whatever stat points govern that class’ combat damage. No matter how you decide to build your party, finding that right groove and tactic can be of utmost importance. Before your spellcasters gain access to a mid-battle MP regeneration, having renewable skills to use every turn will determine how your average turn plays out. Across my six-member party, half of them were dedicated to the use of specific skills and defensive abilities every round while the other three adjusted their attacks depending on whether I was fighting one row of enemies or three. Many of the tactics that players have picked up from Operation Abyss or Stranger of Sword City carry over all the same. Once you hit that groove and develop a reliable single-turn strategy, Operation Babel offers a fast battle system that instantly commences a full turn of battle (something that I wish Wizardry and Etrian Odyssey can offer). As an RPG where grinding levels is paramount to survival, spending an extra twenty minutes in each dungeon can help keep players ahead of the difficulty curve. In contrast to the innovation of its predecessor, Operation Babel feels largely like the same game that Vita owners had explored two years prior. 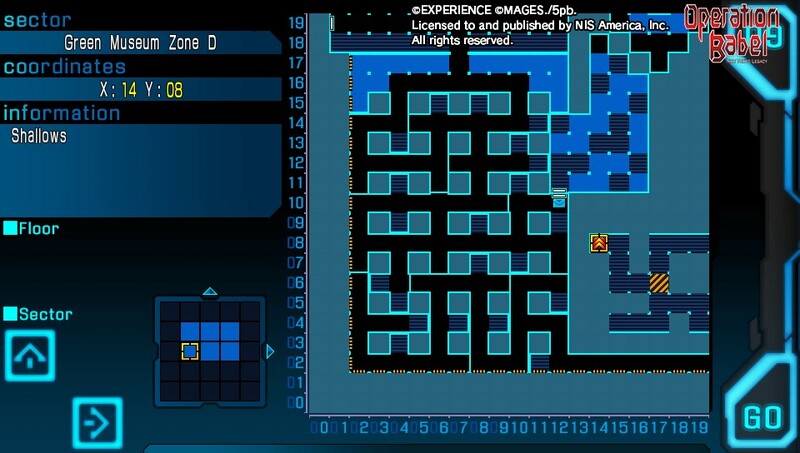 Assets, music, even item and skill names are taken wholesale from one game and transferred into this sequel, making Operation Babel appear as a full-sized expansion rather than a standalone game. With a story that largely relies on past experience with the Xth Squad, characters routinely enter the story for single scenes with little explanation and assume that the player is already familiar in their relevancy. The main campaign should take players roughly thirty hours (I clocked in closer to 36 by the time credits started to roll, due in part to experimentation with new Blood classes and excessive grinding) with Experience’s signature post-game dungeons and bosses that will provide at least another five-plus hours of content. These extra bosses tower far over the main game’s offerings and can only be recommended for the most stalwart of players that don’t mind an exercise in patience and frustration with Operation Babel’s usage of instant death attacks when the player fails to maintain their defensive line. Dungeon RPG’s have a history of being cryptic in their design, forcing the player to persevere through trial and error or the guidance of fellow players. Operation Babel proves to be just as obtuse as its predecessor in many regards. An internal Squad Handbook helps to cover the basics, but when it comes to reliably disarming rigged treasure chests or knowing how to withstand a boss’ attacks, that relies on the player’s own intuition to discover how to become a better Code-Riser. If there’s one tip to consider for new players, having an Academic is the single greatest addition to the Xth Squad. Not only can they provide essential buffs at higher levels (increased encounter rates and boosted defense against special attacks), they are the only class that can reliably open treasure chests and identify their contents which, in turn, provide the party with the only equipment worth using as the only shop in the game typically sells lower level trash. Thematically, Operation Babel: New Tokyo Legacy doesn’t have as strong a story as the original, something that tends to happen in sequels. In the stead of a compelling narrative, the gameplay exceeds even with simple revisions. The new sub-classing system gives players more control over fine tuning their perfect six-member squad and new tactical combinations that fit right in line with other titles in the genre. Operation Babel: New Tokyo Legacy is a fine sendoff for the Vita’s eventual sunsetting as a portable RPG powerhouse and can rival the Etrian Odyssey series for tactical superiority. Review code provided by the publisher. You can buy it via Amazon here.